Earth Dave: Everything Is Awesome! 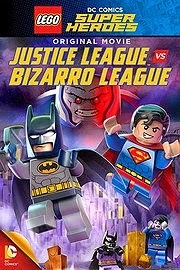 The Lego feature, Justice League vs. Bizarro League is an enjoyable animated movie. The film opens with Bizarro terrorizing a playground full of children and their mothers in a battle with a merry-go-round octopus. For Bizarro, everything is opposite, yet in most instances he is still driven by a need to be a hero and save the day. In comic book stories, Bizarro's opposite sense of rescue is to put someone in danger. Here, that doesn't seem to be the case. The danger comes as a byproduct of Bizarro's rescue effort. He's not portrayed as a villain. More than less he comes off as a hapless hero, a wannabe. He's also confused as Superman's twin brother. something that causes The Man of Steel no end of embarrassment. This brotherhood drives the story of the film. Superman banishes his ugly, "red-headed stepbrother" to the square Bizarroworld. He uses natural, inanimate rocks to create citizens for Bizarro to protect, and create a Bizarro Daily Planet building. This is where Bizarro develops a sense of putting those around him in danger, so that he can then step in and save the day. Although Bizarro is an imperfect clone created by Luthor, Superman's actions develop Bizarro's villainous behavior and character. Bizarro comes off as lonely and unfortunate. A sad, tragic figure. Like the kid in school that nobody will play with. Here, Bizarro comes off with more empathy than in any previous appearance. The shift in storytelling as writers such as Sholly Fisch will tell you, is that there are no bad people, just bad decisions and actions. A true villain, according to Robert McKee's Story, is the character that thinks he's the hero and what he is doing is right. That's Bizarro. Not long after being banished to Bizarroworld, the super-Frankenstein returns, gets his hands on Luthor's duplicator ray-gun and zaps the Justice League, creating Batzarro, the world's worst detective; Bizarra, Wonder Woman's warrior princess counter; Cyzarro, a duplicate of Cyborg, and Greenzarro a timid version of Guy Gardner. Bizarro an his League overpower the Justice League and make their escape to Bizarroworld. The Justice League follows. On Bizarroworld, both Leagues face Darksied!, and Desaad! They are harvesting the strange rocks on Bizarroworld to power a weapon to use against Earth's heroes! Duh-duh-duh-duhnnnnn!!!! Both Leagues must work together to stop Darksied. As if things weren't already complicated, Bizarro has Luthor's Kryptonite bomb and Batman has brought along his own chunk of Kryptonite! In the end however (SPOILER ALERT) team-work, camaraderie and brotherly-love save the day. There are a lot of things that make this feature enjoyable. Even though I can't bring myself to acknowledge Teen Titan Vic Stone as a Justice League Member, Cyborg and Guy Gardner provide comic relief. So does Batman, as his distrust of Superman and working as part of a team builds over the course of the adventure. Cyborg as comic relief is both a pro and a con. His constant prattle is just a reminder that he is a better fit with the Teen Titans. He comes off more as a sidekick than a colleague. I understand his inclusion in the League: with Superman and Green Lantern filling the cosmic role, J'onn J'onzz is the odd man out as a Martian. In modern times, technology has replaced science fiction as a frontier. Also, as a Martian, J'onn is more of a local, than the other mysterious alien races. Still, the League's classic line-up has stood the test of time. Cyborg was the only real source of grating irritation. The rest of the story is a nice throwback to when DC super-heroes and cartoons were fun and wacky, like Super Friends. I give Lego Justice League vs. Bizarro League five stars for awesomeness.